We place tremendous value on music within our school, as we believe it is integral to the development of the whole child. Our school has many children from a diverse range of cultural backgrounds and music enables us to embrace the diversity of our pupils. We use music to inspire our learners across the curriculum, from developing ideas for their writing, to promoting our values and ethos. We love singing, and embrace the power of music as a learning tool whenever possible. We showcase this learning in class and unit assemblies and performances. We are a Gold In Harmony school and our pupils achieve highly in music as a result of the specialist support and resources we provide. Our external providers all work very closely with our teaching staff to embed their work alongside topics and themes begin explored by the school. The children at our school all learn to play the recorder in Key Stage 1, and then progress onto their choice of string instrument in year 3. The teachers in our school learn a musical instrument alongside the children, and when ready, sit graded exams with them. All of our children leave school with a recognised music qualification, achieving Music Medals or Arts Awards in years 3 and 4, and having the opportunity to progress onto achieving their Grade 1 or Grade 2 music qualifications in years 5 and 6. 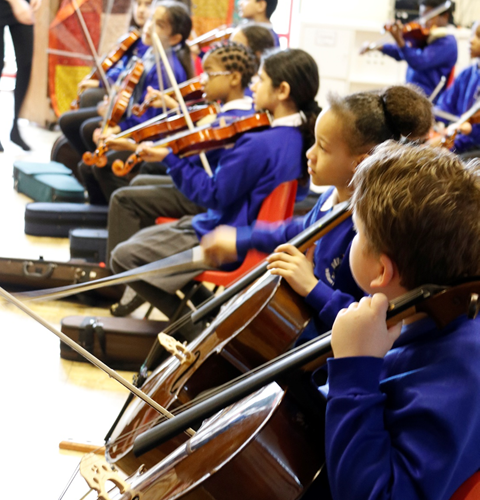 Our Key Stage 2 school orchestras practice together every week, and children receive weekly whole-class lessons in addition to this. Many children participate in lunchtime music clubs to further develop their skills. We go on school trips to hear orchestras perform and have strong links with a quartet that plays for the children in an interactive performance annually. Every year a group of children from year 5 have the opportunity to attend a music residential. Our children also participate in concerts with other schools such as the Great Orchestra Experiment. Our children are given regular opportunities to perform and experience live performances both within and outside of the school building. We provide all children with the opportunity to continue their music lessons at secondary school and host the Area Band for our local area.